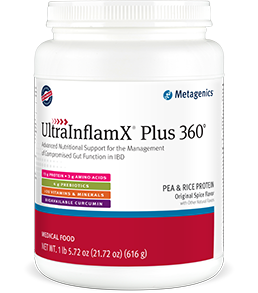 UltraInflamX® Plus 360 is a medical food formulated to provide specialized nutritional support-including reduced iso-alpha acids (RIAA, from hops), L-glutamine, and easily digestible rice protein-for patients experiencing inflammation and pain associated with inflammatory bowel disease (IBD), such as Crohn's disease and ulcerative colitis. Features selective kinase response modulators (SKRMs) in the form of RIAA, which has been shown to beneficially influence the function of enzymes involved in inflammatory processes. Blend (for no longer than 15 seconds), shake, or briskly stir about 2 level scoops (52 grams) of UltraInflamX PLUS 360? into 8 fluid ounces of chilled water or juice, or acceptable fruit as listed in the dietary guidelines. Follow recommended dosage guidelines (UltraInflamX Quick-Start Guide/Patient Guide) or as directed by your healthcare practitioner. Consume within 10 minutes of reconstitution. Saturated fat content is contributed by a beneficial form of fat, medium chain triglycerides, which have recognized health benefits. ORAC Value is a measure of antioxidant potential.